This post will be a continuation of the Level Select Scroll Menu and the Level Lock / Unlock System. Follow the two posts in order so as to get a grip of this post which will be on How to create a three star rating system, just like the one you see in games like Angry Birds, using unity's new GUI. Now, if I expand the Level1, Level2 buttons, I see a Text component in each of them. To this Level buttons we'll add four images for no stars, one star, two star and three stars respectively. We will place these star images inside a Panel, which in turn will be inside the Level buttons. 1. Create a Panel inside the Level1 button. Rename it to StarPanel. Change the color of this panel to any color you like and which is different from the background color. Also, resize the panel and place it to the right edge of the button as shown in the image below. Make sure you move the anchor points to the edge of the panel. Change the font size of the Text component of the Level buttons in case the whole text is not visible. 2. Add an Image component inside the Panel and name it 1star0. 1 stands for the level number and 0 stands for no stars. Resize this image to fit the panel and also place the anchors to the edges of this image. 3. Download the images from this link and import them into your project. Add the three_stars_empty to the Source Image field of the Image component added above. 4. Duplicate the image component thrice and name them as 1star1, 1star2 and 1star3. Add the source images from the images downloaded above. Disable the Image (Script) component of these Images you just added so that they are not visible by default. 5. Repeat the above steps for the other level buttons as well. Remember, you have to name the images as 2star0, 2star1, 2star2 and 2star3 for level 2 images and so on. 6. Open the LevelSelectScript attached to the Main Camera and replace the old code with the below code. This new code has some additions to it which are well commented for you to easily understand it. 7. Save this scene and switch to the Level1.1 scene. The hierarchy of this scene should have the following components. Before we proceed with the next step, I would like to let you know how are we going to detect what star the player has obtained. We give 3 stars if the player reaches the goal within 5 sec, 2 stars for within 10 sec and 1 star for anything greater than 10 sec. 8. Add a Text component inside the Canvas and name it as Time. Change the text to be displayed of the Text (Script) to TIME: 0.0, which is the initial time to be displayed. 9. Add a Panel inside the Canvas named StarPanel and make its background transparent by setting the alpha value to 0. 10. Add an Image component inside this StarPanel. Name it as star1 and in the Source Image field drag and drop the one star sprite. Duplicate the image twice and name the duplicated images as star2 and star3 respectively. Drag and drop the respective images into their Source Image field. Note the position of the anchor points. 11. Next we add a Button inside the Canvas to move to the World1 level once the level is completed and this button is clicked. Name this button as Next. Change the Text to be displayed as Next. You should have a PlayerMovement script. Add the below code to it. Save the script and return to unity. Notice that this script attached to the Player now expects a Timer Text field to be filled with a Text component. Drag and drop the Time text component here. 12. Finally, we will add an OnClick event to the Next button. Click on the + symbol to add an event. 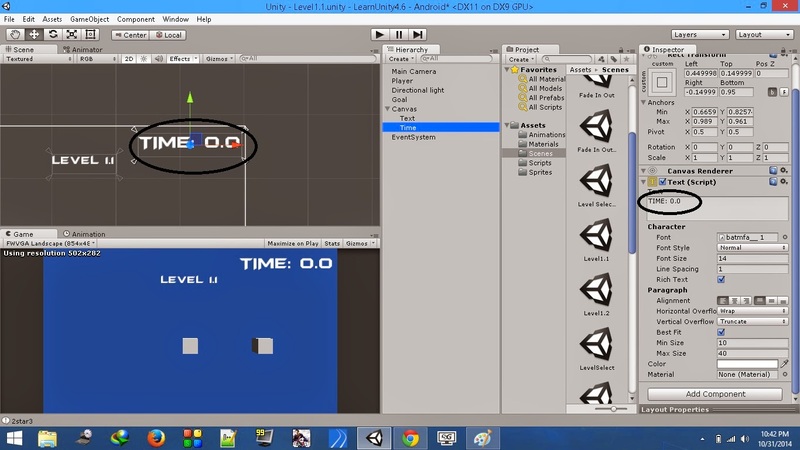 Drag and drop the Player object into the Object field. Select the PlayerMovement->OnClickButton function in the function field. Save the scene and repeat the same steps for the Level1.2 and the other scenes as well. Now you are ready to test this beauty. Click play and try it out. Hi I tried your tutorial and it works on Level1.1 and it also works for Level1 on World1 scene, it actually shows the highest rank of stars for level1. But when i play the Level1.2 even though it works in the level it does not work on World1. Which means the stars are not assigned to Level2 button in the World1 scene. Any help ? The highest star is saved in the playerprefs and it is not overwritten when you complete the same level with lower rating..
Also, make sure the hierarchy of the Level2 button is as shown in the image captioned "Level Buttons Hierarchy"
As in step 4 make sure you have "Disabled the Image (Script) component of the Images"
I seem to have a problem getting this to go to from level 1 to level 2. I get an error after clicking on the next button. Any idea how I can resolve it. The code is as set out here. Have you followed the previous two tutorials before moving to this one, the ones mentioned in the beginning of this post? Looks like the error might be due to the naming of the lock images. Thankyou, yes I followed the tutorial as you said and made the typo on the name of the "LockedLevel2" as LockedLevel 2". Unity did not like the space. It is working great now, thankyou for your very explained Tutorials. Cool.. Its great that you got it working. And thanks for letting us know that it's working fine now. Cheers! Hi. Great tutorial. 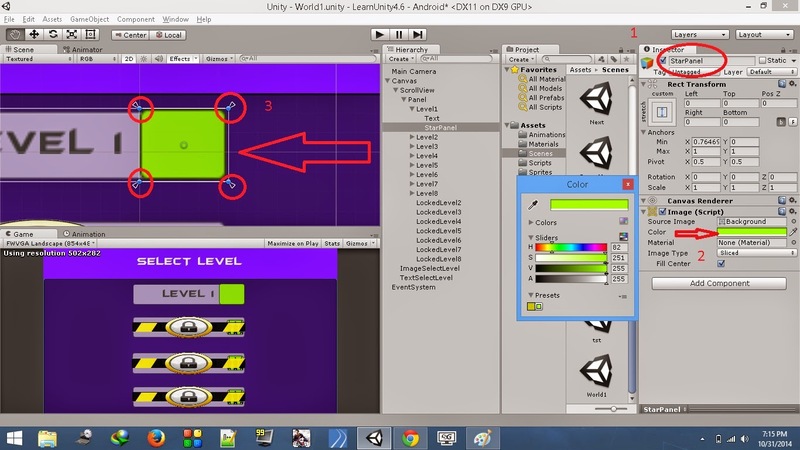 It helped me a lot implementing the level unlock system in my game. However, I can't seem to make the star reward system to work. My game is written mostly in JS, so when I incorporated your scripts, I had to translate them from C#. Level unlock worked fine, but Star Reward just won't go. Must be my poor translating skills. That did the trick, in case anyone else has the same issue. Thanks again! I would like to thank you for your kind gesture and I would seriously like to see our other readrs doing this. Glad you visited us and hopefully you will find the other posts interesting too. 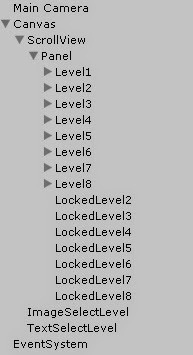 Refer the Level Button Hierarchy image in the post above and make sure you have the same naming conventions. The reason you are getting the null reference exception is because you have either named the objects something else or the object themselves are not present. Hi, I also have an error occurred in this line. please tell me how to make time with minutes and seconds? Hi. First of all , thank you for these excellent tutorials. They help us a lot to those who started . I want to set a totalTime variable for 1, 2 and 3 stars, and can set from unity without edit the script every time, and reuse the script for all maps, and put diferents times to win Stars each maps. And create something to replace if ( totalTime < 5) with timerStar1 , or what we can , and so with the other stars . But my c # skills are not very good. Could you give me a hand to implement this? Hi, thank you for this great tutorial it helps me very much and I really need your help, how about 2 goal object one is the yes goal or the goal that can gain star and the other one is Not or it can gain no star..! can you help me how to do that..